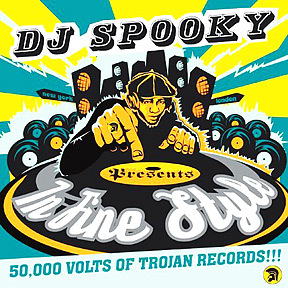 "DJ Spooky Presents In the Style: 50,000 Volts of Trojan Records"
NEW YORK'S DJ Spooky (Paul Miller) has always been one of the scene's more scholarly turntablists. The man has degrees in philosophy and French literature, for gosh sakes! And his astute liner notes for this smart selection of prime reggae cuts offers up his unique historical spin. In his tribute to the origins of portable discos ("sound systems" in Jamaica), Miller makes a case for a through line between music's analog past to present-day digital. The concept of the 45-rpm vinyl single has morphed into iPod downloads, and reggae covers of pop tunes of the day (called "versions") are the precursors of today's mash-ups. With his own family roots in the Caribbean island, Miller has searched the vaults of the crucial Trojan record label to hand pick choice tunes that would sound great in any club. It's two discs' worth of the weird and wonderful. Both of them kick off with tracks from the relatively obscure toaster Winston Williams. His "Sweet Like Candy" and "DJ's Choice" are prime examples of the best of reggae deejay wordplay. Another artist who gets double play is Dave Barker, better known for his work with Ansel Collins. "Funky, Funky Reggae" and "Hot Sauce (aka the Agro Man Is Back)" favors his deejay skills over his equally known singing. Yet another former singing partner of Barker's, Bruce Ruffin, is featured on a lovely horn-and-string-laden version of Jose Feliciano's "Rain." THE MIX of obscurities and unexpected versions rule DJ Spooky's collection, and there are gems a-plenty to savor in this generous compilation. Of the minor hits, there's Desmond Dekker's "007 Shanty Town" and classic tunes of rock steady, with the Jamaicans' "Ba Ba Boom," and ska, in Dandy Livingstone's "Rudy a Message to You." The latter was covered with great success by the British 2-Tone band the Specials. Speaking of the Specials, the collection closes with a live number from a supergroup that brought together members of the Specials and the English Beat. The Special Beat offer up a tough 'n' lively rendition of "Rough Rider," itself a cover of the Prince Buster ska favorite. And there is so much more to discover on this collection. If you call yourself a reggae fan, you owe yourself a listen to this.